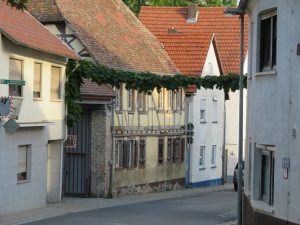 From the very first email, I felt my ancestral town of Osthofen reaching out to welcome me. The email was, of course, not from the town itself but from my guide for the day, Ursula Feile from the tourist office. Her cheery note: “We’re so excited you’re visiting the town of your ancestors. We’ll show you around and drink wine,” immediately drew me in. When I arrived in Osthofen, she greeted me with “I have something special planned.” Our first stop was a small coffee shop—which also happened to be my ancestors’ church. 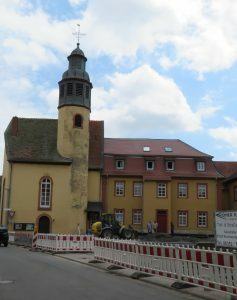 In the 1700s and early 1800s, Osthofen had two churches. The large, impressive, stained-glass-windows and frescos-on-the-wall church on the hill overlooking the town was the home of the larger Reform congregation. 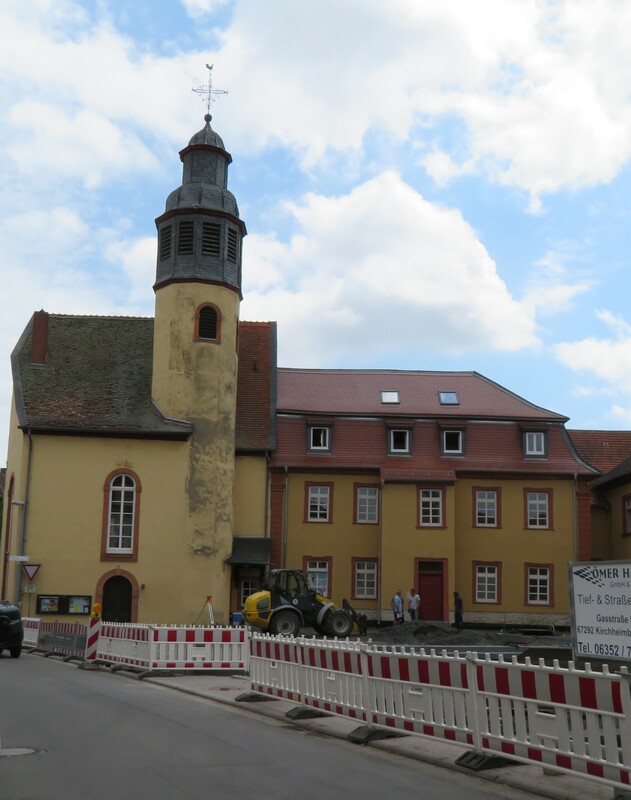 The Lutheran church (where my Schott family attended) was smaller and plainer, dark wood and white walls, occupying a street corner in the center of town. Today, the “little church” has been renovated. The top floor is used for worship services in winter, while the ground floor serves as a coffee shop that sells fair trade goods to raise money for projects to alleviate poverty in Africa. I felt so proud. Not only is my ancestors’ church still in use, but it practices the social mission of the Church by following Jesus’ command to love your neighbor wherever they are. Wow. 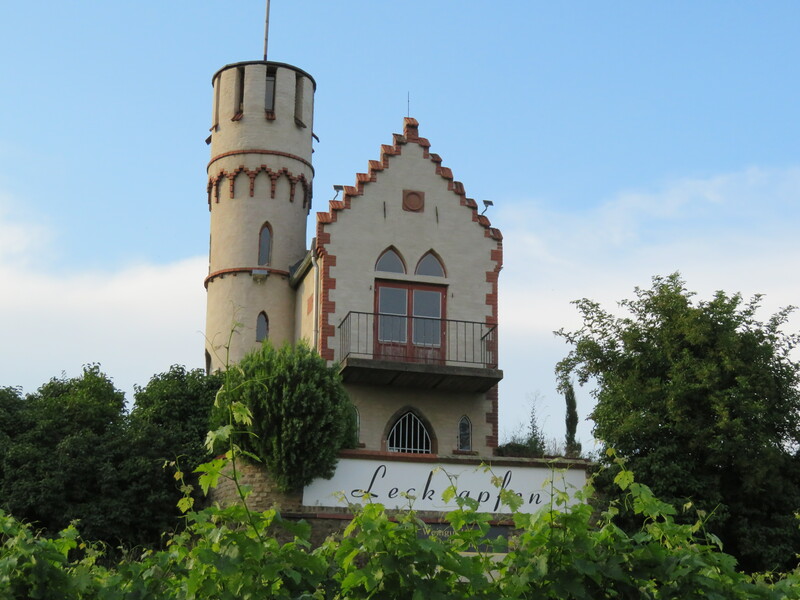 Wine is an important part of Osthofen’s culture—the town is surrounded by vineyards. So the natural next event was hiking through the vineyards, or the Weinberge. I understood Ursula’s concern that I wear good shoes for our walk, but it was a bit of a surprise to find that we were actually hiking to the next village. I thought the discussion of nearby Mühlheim was about history, not destination. (Clearly, I need to work on my German language skills.) But the short hike provided beautiful views and a visit to a centuries-old mill, now the home of one of Ursula’s friends. Ursula had gathered a group of local guides for dinner, all passionate about local history and interested in my journey to seek out my ancestors. They told me about the history of the town; I told them about the Schott family’s adventures traveling to Galicia (now western Ukraine) and the Black Sea area after they’d left Osthofen. The restaurant was beautiful with an interesting upscale menu, but was located in a former stable with a soaring stone-vaulted ceiling. After dinner, we stopped at a small wine garden, open only a couple of nights per week. It looked more like a big family party than a public place. I would have felt like I was intruding if I’d walked in on my own. But the owners loved my story about seeking out my roots and poured me some wine. A visit to the big, ornate church on the hill and a personalized tour of the local Heimatmuseum the next morning helped me learn more about how people had lived in Osthofen for centuries. But simply walking through the town with Ursula was almost more special. She had a gift for relating what we saw to my ancestors’ time. She helped me see beyond the modern façade to see the lines of a small typical home in the 18th century. Her descriptions brought blocks of stone and wire fencing along a creek-side walkway to life with scenes of the village women gathering to do their wash and share the daily news. As a genealogist, the most special moment was a trip to the cemetery. I’ve wandered many cemeteries in search of my ancestors’ final resting places. For my grandparents and a couple of great-grandparents in the Dakotas, this was a simple search. But cemeteries in Germany, Ukraine, Hungary have been a disappointment. German cemeteries in Ukraine and Hungary have mostly been destroyed. Cemeteries in Germany recycle their graves, and you rarely find any older than 35 years. 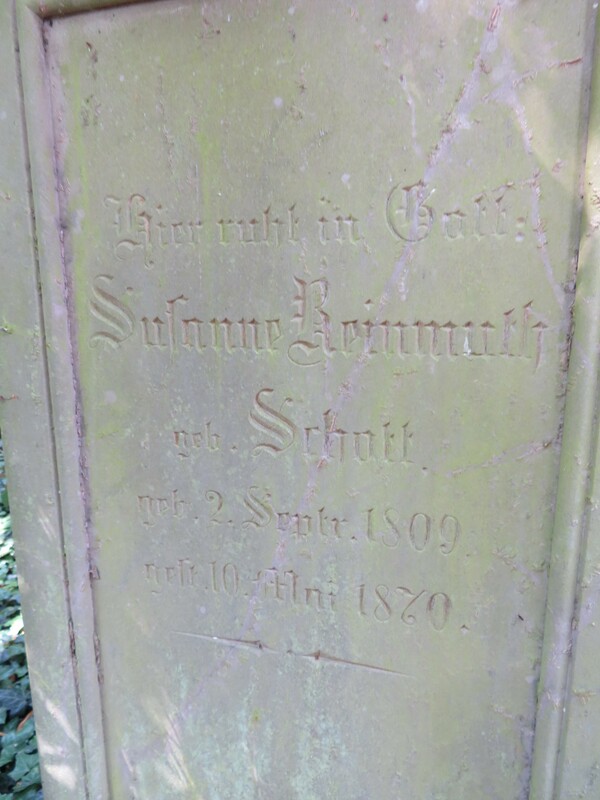 When Ursula said she had a Schott grave to show me, I didn’t hold out much hope. There was another Schott family in Osthofen, larger than mine and connected to the larger Reform congregation. 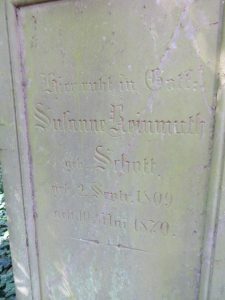 Any Schott graves were likely to belong to them. When she pointed out the partially overgrown stone of Susanna Schott, born 1809—the year my 3x great-grandparents, Philipp Jakob and Maria Dorothea (Finger) Schott left Osthofen—I dutifully took a photo, but without much enthusiasm. But when I compared the photo to my family tree, I discovered that Susanna is related to me not once, but twice! She’s my first cousin four times removed because her grandparents, Johann Jacob and Anna Margaretha (Lacker) Finger, are my 4x great-grandparents. She’s also my second cousin four times removed because her great-grandparents, Michael and Maria Elisabetha (Reichert) Schott, are my 5x great grandparents. There is still a little part of me, a little trace of my family history, in Osthofen after all. Osthofen is a modern German town, a bedroom community of Worms with an industrial area on the edge of town that no doubt provides employment for much of the population. Its surrounding vineyards give it a pleasant setting, but it doesn’t have the storybook, postcard-perfect charm of many German villages I’ve seen. But on this visit, Osthofen captivated me. Unlike previous visits, in which I’d wandered the streets on my own hoping to feel the lingering presence of family ghosts, this time I felt the warmth of the town reach out to me. I could picture Maria Dorothea, and her mother Anna Margaretha before her, gathered at the river washing clothes. I could imagine them leaving their small house and walking to the church for worship each Sunday. I felt the camaraderie with my new-found friends as local wine fueled an animated discussion of the town’s heritage. And in finding Susanna’s grave, I found that a little piece of my family remains anchored to the town, despite the wandering of Philipp Jakob and Maria Dorothea as they migrated eastward. My feet have walked in the path of generations of Schotts and Fingers, and I have been welcomed back after centuries of family wandering. It felt good to be welcomed home. Thanks for a very interesting article. I hope one day I can visit some of these wonderful places. I recently discovered I am a descendant of Heinrich Schott via Reinier Schott/Elizabeth Hoogmoed (Netherlands), and I was wondering are you from that same branch of the Schott family? I’m not related to that branch that I’m aware of, but you never know. Was your Schott family in Osthofen? About what year? I love your reports! Thanks for sharing your rootsteps journeys. Makes me wish I had Osthofen ancestors! I loved visited ancestral places in the UK, but it never occurred to me to contact the local tourist office. Great idea.